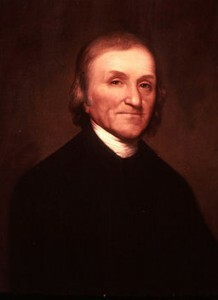 Joseph Priestley is one of the most celebrated chemists of all time because of his role in the discovery of oxygen. So highly was he regarded that in 1922 the American Chemical Society named their most prestigious medal ‘The Priestley Medal’. He goes on to mention one of the ‘rules of philosophizing’ in this discipline: ‘to admit no more causes than are necessary to account for the effects’ (p. 3). Of course, this is Newton’s first rule of philosophizing from the second edition of the Principia and it is hardly surprising that Priestley goes on to claim that given the ‘power of gravity’ ‘we are authorized to reject the Cartesian Vortices’ (ibid.). One might, therefore, regard Priestley’s writings as not having anything to teach us about early modern experimental philosophy. And yet there is at least one point that is worth highlighting, for, Priestley was the second person to use the term ‘empiricism’ in the title of a book in English. The first was Francis Guybon in his An Essay concerning the Growth of Empiricism; or the Encouragement of Quacks, London, 1712 which was an attack on medical quacks. What is interesting here is that ‘empiricism’ is used as a pejorative and is loosely associated with Descartes! This all predates the Kantian Rationalism and Empiricism distinction –– the RED. It is even tempting to claim that it shows the inappropriateness of foisting the term ‘empiricism’ in its Kantian sense on eighteenth century thinkers when it already had strong currency in eighteenth-century English with an entirely different meaning. For those familiar with the rhetoric and methodology of Early Modern Experimental Philosophy (the faithful readers of this blog among them) it is no surprise that the emphasis on facts, observation, and experiment as the only solid grounds of knowledge was highlighted in almost every published text by the promoters of the experimental method. Within natural philosophy, the relevant facts and experiments were confined to nature and its workings. However, pinpointing the relevant facts and observations for knowledge in areas outside of natural philosophy was a more delicate matter. As we have argued for in this blog, the methodology of Early Modern Experimental Philosophy was adopted by many eighteenth-century figures in areas traditionally contained under moral philosophy, such as ethics, aesthetics, and theology. But which sort of facts and observations entitled them to apply the same methodology that had contributed so much to the progress of mankind and our knowledge of the natural world? George Turnbull (the philosopher, teacher, and theologian who has many times been the subject of our posts) thought that introspection could give us access to facts about the anatomy of our mind, and that paintings provided in moral philosophy the same role experiments did in natural. But what about facts and observations regarding religious thought? A couple of years ago I commented on Turnbull’s ‘experimental theism.’ We saw how Turnbull argued that the miracles performed by Jesus Christ serve as the samples and experiments that prove that he truly was the son of God and possessed knowledge of a more perfect stage in nature. However, the only evidence we have of those miracles is found in the gospels of the apostles, so why is it that those accounts of miracles count as proper evidence? David Hume’s rejection of miracles was based precisely on the claim that evidence from testimony would never be stronger than evidence from experience, and so belief in miracles from testimony of them is not justified. Turnbull, on the other hand, believed that the testimony given in the gospels was in fact enough evidence, and it is his argument that I want to focus on for the rest of today’s post. It seems that Turnbull does not confront the issue of the reliability of testimony as proper evidence. Of course, he could argue that we do not have any reason to doubt the account given by the apostles because they are characterized as having a virtuous moral character, and so is Jesus. But these accounts come from the gospels themselves, so unless we have an external account of the moral character of those giving the testimony, it seems that we might have grounds to doubt them. Turnbull, however, seems to think that this is not an issue and that in fact “the enemies of Christianity have in no age ever attacked the evidence” for the history of Jesus Christ. In particular, Turnbull argues that the main reason to accept the evidence from testimony is the fact that it is not inconsistent with the knowledge we gain from our observation of the natural world. The main purpose of Turnbull’s text is to show that revealed religion confirms the knowledge accessed from natural religion, and it is in this sense that the former is useful. So as long as testimony agrees with experience, there is no reason to reject it. It appears then that the testimony of the gospels is just a different kind of evidence for the Christian doctrines, and since it confirms the claims we have deduced from our experience of the world, then such testimony is reliable. Turnbull can only claim that testimony is reliable after proving the doctrines from natural religion, i.e. by examining the world and the workings of our mind. So Turnbull’s strategy is not to argue for the reliability of testimony itself, but rather to claim that since it is not inconsistent with what we have learnt from experience, then there is no reason to reject it.